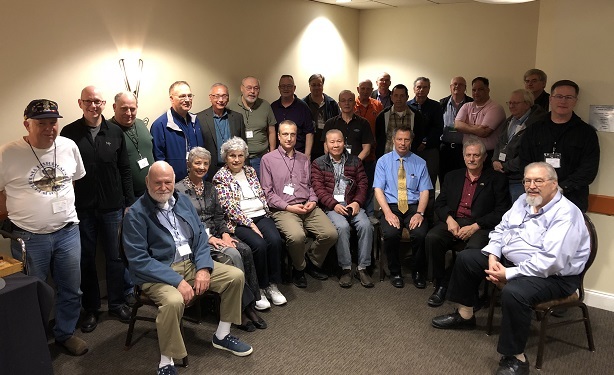 First of all, let me say hello from Charlotte, NC, where I am currently attending the Crypto History Symposium. Like always, it’s a great event. 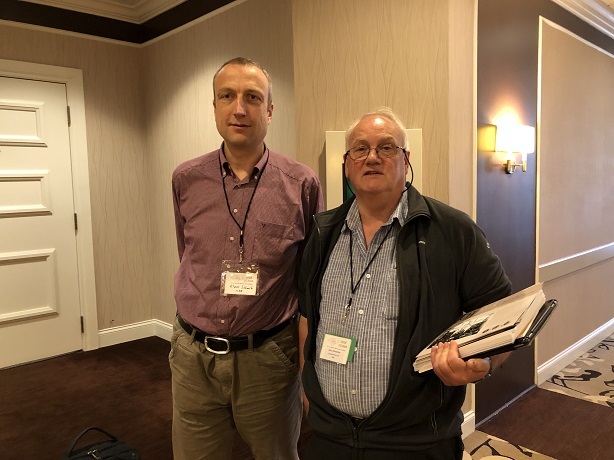 I gave two talks (about unsolved crypto mysteries and German ciphers in WW2), which were well received. I am very grateful to Jeff Law for organizing this symposium. The Criptografo Palacios is partially made out of tinplate, which makes it look like a tin toy. It may even have been produced by a toy company. However, this device was certainly not meant as a plaything but as a serious encryption tool. I am sure that it was considerably more expensive than a toy. 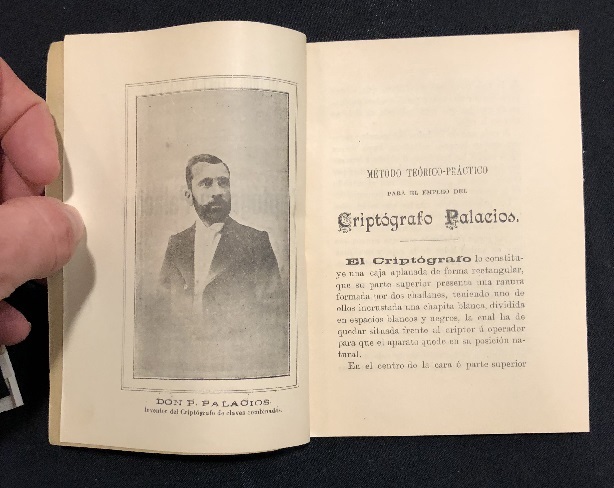 John Alexander, along with a few other conference attendees, is still trying to find out how the Criptografo Palacios works (the manual is in Spanish, which makes things a little tricky). It probably implements a strip cipher, similar to the M-138. Neither the manual nor the device itself provides any information about the age of the Criptografo Palacios. John and I think that it might have been made in the 1920s, when many new cipher tools came to the market, including nice (but insecure and inconvenient) designs like the Kryha machine, the Beyer machine, or the Cryptocode. The Criptografo Palacios would fit well in this line. Can a reader find out more about this beautiful encryption device? If so, please let John Alexander and me know. “a curious device called “Palacios cryptographer” whose photograph can be consulted in its “Virtual Museum” ( http://www.oepm.es/ internet / museo_virtual / coleccion.asp? modality = 0 & ref = 25858 & id = 47 ). It’s name is “cryptographer with variable combination keys”, and was patented on April 23, 1900 by Mr. Pablo Palacios Sanz. It is, in essence, a frame that serves to hold a set of strips in which the alphabet is written twice. In this way, a polyalphabetic substitution system is achieved. In contrast, the cryptographer Palacios intended to serve for any type of communications, and was totally vulnerable. Palacios illustrated the strength of his system through various examples. Basically, the idea is the following. With its system, an M message is converted into an encrypted text C by means of a K key by something very similar to the operation C = M + K. Since M = C – K, each possible K key would lead to a new message M. O, as he said, writing K = C – M, different keys would give us different messages, so that nobody can know the message without knowing the key. Well, this argument is technically irrefutable. It is, in fact, very similar to the one-time pad (OTP). But it has two weaknesses. The first is that, as in any cipher system, the more messages are encrypted with the same key, the more likely the attacker will be able to break the system. The second is the classic key distribution. The interlocutors need to exchange a key (or better, a list of them to be able to vary). And this not only forces them to maintain these secret keys, but also clashes with the classical dichotomy: either we use keys as long as the message, or we risk a cryptanalytic attack. And, since the underlying system is a simple figure of Vigenère, the only possibility of maintaining system security is to change the password frequently and encrypt short messages. The astute reader may notice that, of the two “essential points”, the commission emphasizes only one of them. In their opinion, the cryptographer is simple and fast. Great … except they do not say anything about cryptographic security. It sounds like the typical excuse to wriggle out. One of two: or our esteemed Joaquin Garcia Carmona (military expert in cryptography, and the good ones) was on vacation at the time, or very piously did not want to disappoint Mr. Palacios. all the documentation (manuals of use, plans, etc) are now owned by Antonio Gil, an antique dealer from Soria who has very kindly provided me with information and photographs. Some of them you can see here: http://www.cripto.es/museo/palacios.htm . On July 17, 1905 a copy of the book “Metodo Teoretico-Practico” was part of the belongings of King Alfonso XIII. (https://realbiblioteca.patrimonionacional.es/cgi-bin/koha/opac-detail.pl?biblionumber=52092). According to the catalogue entry it contained 61 pages. The copy sold by todocolleccion has 48 pages, but maybe the pages were counted in a different way, f.e. with/ without roman numerals. John could check this. 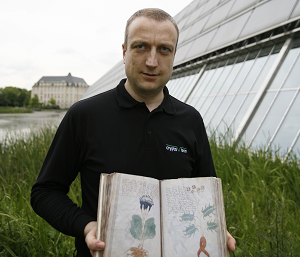 Since the original device was patented in 1900 and the King had the cryptographic method scrutinized in 1902, probably using the copy that was part of the royal library in 1905, I presume the book was printed 1900 – 1902. 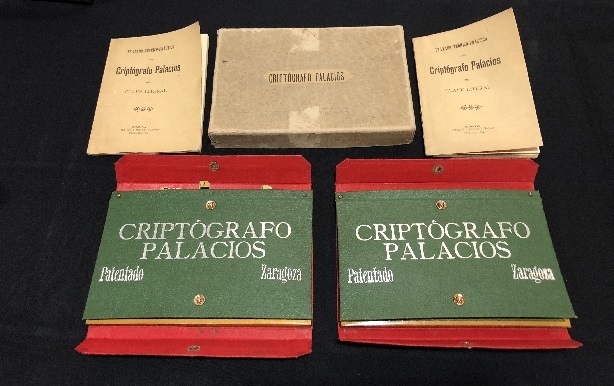 I guess that the devices in the green boxes (captioned as “version infantil”) were later “secondary exploitations” of Palacios’s method, after he had failed to convince the military commision of his system including the original device in 1902. My knowledge & understanding is severely tested at times. I would never be able to make progress if it were not for the help of good people like Klaus Schmee & replies to requests for information. So, thank you all for taking the time to inform me of the history of this system. I really do appreciate it. It was a pleasure. Maybe Antonio Gil from Soria could provide further information. @Thomas: Thank you very much! The information you provided is extremely helpful! 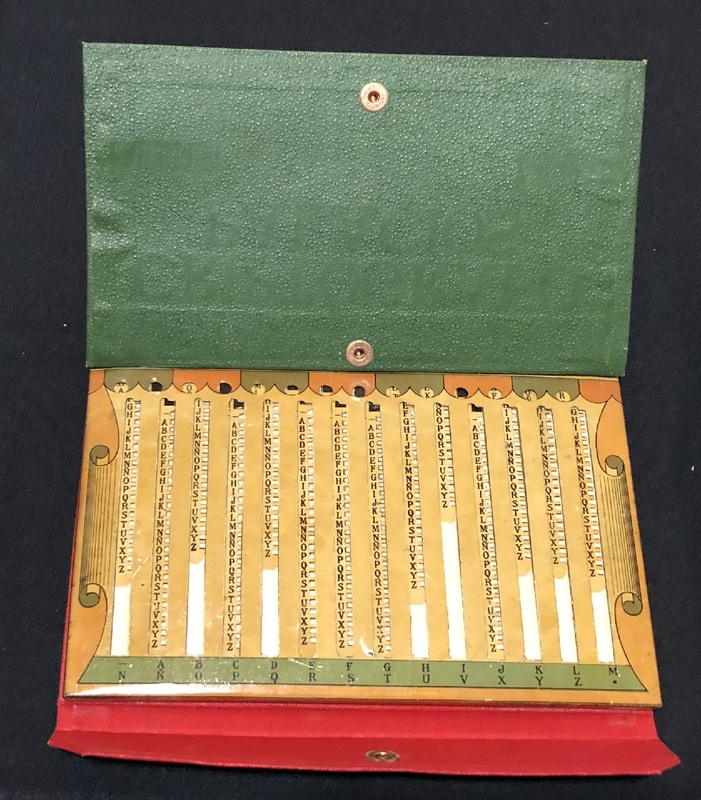 I appreciate Thomas’s extensive comment and would like to add an observation that immediately occurred to me (a historically-not-so-challenged pseudo-cryptologist): Some 280 years ago Athanasius Kircher adapted one of his famous “Kästchen”/boxes (lat. cista) that he first devised in 1650 as a mechanical aid for musicial compositions. In his 1663 “Polygraphai nova” he devoted the first part to (what he considered) universal communication, but in the 3rd part of this book he devised some excellent polyalphabetic and double encryption systems. In this section you will also find an illustration of a “Cista Steganograpica” (and I am sorry I do not manage to incoporate the page(s) from his book here), a tallish wooden box with several rows of small compartments. 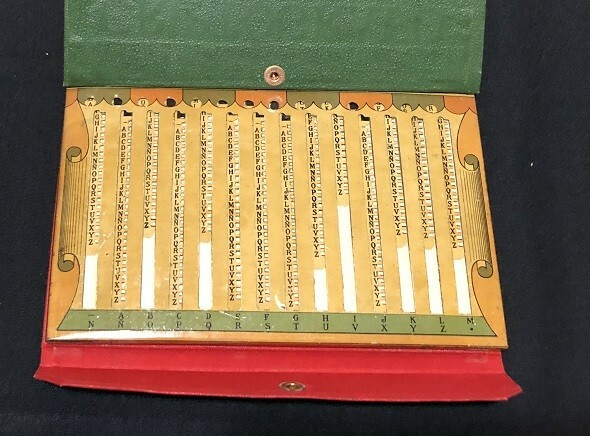 On separate pages he then illustrated the rods inscribed with letters and numbers that could be inserted in each of these compartments, and by adjusting the cleartext letters to the level of the box he would “automatically” generate the encryption. The book is easily accessible in several digitized versions, if anyone were interested in having a look at this system, and I’ll be glad to explain it in more detail if there were any interest (and/or incorporate the relevant pages if someone told me how to handle this technically). Do you think Palacios’s system is similar to the method underlying the “Arca steganografica”? Fabulous! Wish I could have made it.